((Its strange, As if they all disappeared)) Aiko pinned his ears back and began running after Samuel, His tail swishing behind him. He began catching up to the lion grinning. Charging forward, he was determined to win. "Lions can go faster than dogs.... right?" Emmalee: "Yes, but a small cat can go faster than a lion." I raced ahead of my crush and the other boy, reaching the sand dunes first. Aiko skidded to a halt kicking up sand "Whoa..." he said shaking the dust off his head "That was fast" he looked at Samuel "She only won cause we didn't see her coming" he said making up an excuse. I tossed my hair over my shoulder. "Sure." I laughed. I made sure no-one was aroulnd bedore pulling off my hat, sunglasses, and my tail out of my pants. Emmalee: I screamed, and hid behind Aiko. (I want her to be.) I whispered something in his ear. "Just in casae this is the last time I ever see you, I'm gonna tell you I like you. Like, really like you." ((Aiko won't get caught)) Aiko blushed and looked from Emmalee to the men, His eyes widened unsure of what to do "I've Got a Confession to" he whimpered "I'm a coward..." he lowered his head to the ground "I don't want to be put behind bars again...And i don't want you to either"
One of the men shot a sleeping dart at Samuel, making him lose balance and fall down. "Ugh...", he muttered, closing his eyes. They then got a cage and shoved him into it. Emmalee: "Aw, that's so sweet!" I hugged him. Probably not the best idea. But one of the men snuck up behind us, and he blew sleep gas on me and I passed out, seeing the hazy figure of a cage in front of me. "Is that.... one of them? ", the man asked, "Man, we'd get a fortune if we put her on display... I wonder if the rest of them are...."
Aiko began backing up before making a break for it, if they thought he was a real Wild dog they might not pursue him but he didn't want to leave them, his first friend since he got to this place. "I think so." THe man said. "Nice. Lets get 'em into the truck. ", the man instructed. Aiko stopped and looked back watching the truck. He lowered his head to the ground trying to blend in with the sand, Maybe he could follow the truck. The rest of the men obeyed and through the two bodies into the truck. Aiko watched the truck preparing to leave and slunk along the sand closer to it, he was ready to follow it watching the vehicle carefully. The car started, and the crew quickly jumped into the truck. The truck then quickly drove away. Samuel groaned, feeling horrible. It was like a thousand pounds was resting on his eyes, and there was no way to open them. The air around him smelled disgusting, and the constant shaking of the place made him conclude that he was in a truck, going straight to the zoo. Emmalee: "Other person who *yawns* I don't know the name of that's a lion dude?" I said. "You OKish? I'm not." i then fell asleep. Aiko ran after the truck, Catching up slightly but beginning to fall behind till he could no longer see the truck. He followed the tracks to the zoo. We removed your clothes because they are un-animal-like. I scowled and spat on the ground. Aiko looked at the Zoo entrance and began human...They wouldn't recognize him. he came to the entrance but realized he hadn't got money "Right..." he turned around and disappeared for a while. He came back dressed in shorts, long zoo employee coat and a mustache walking up to the person he tried to walk by "I..I work here! Let me in, Do you not see my name tag" there was a moment silence "Go on in Mister...Randal" Aiko grinned and walked in "Now which section would they be in" he said staring at a sign. Samuel opened his eyes, looking around. He was behind a glass case, with people staring at him with awe. Slowly getting up, he noticed he had a collar across his furry neck, and a tag on his ear. They read 'Sammy' . Oh great, he thought, I'm stuck in a zoo, and I'm tagged. 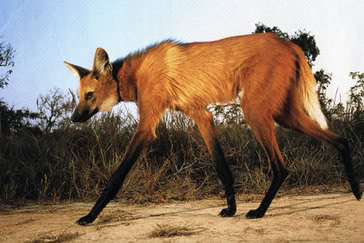 Maned Wolf , like all maned wolfs, Kalliope has long and slender legs and a pelt of fire. Most of her legs are black, up until her armpit, and then the rest up is a reddish orange fur. Her muzzle is black, as are her ears and part of her tail. She looks like a cheetah when she runs, fast and with long limbs, a blur of red. Human , kalliope stands at around five foot seven, tall and skinny like her wolf form. She sports long, chestnut hair died with red and black tips, along with one red streak at the front. Her bangs curve over her left eye in a somewhat emo fashion. She prefers to wear tall, knee-length boots, or her fighting boots, which are made of tough black leather. She enjoys to wear fishnet leggings underneath jean shorts or pants, or no fishnet at all. Kalliope prefers t-shirts or tank tops, saying that long sleeve shirts limit her fighting room and flexibility. Kalliope's odd eyes are complex, part of the testing creating this to happen. Her eyes change color. It happens randomly for most of the time, but first they may be blue with gold and silver flecks in them, the next day an unnaturally dark purple. They can change with her mood also, and when she is angry, they turn a firey red. No one knows how it happened, but it just does. Often times, she has black headphones on to listen to her music, or she just has headphones on for no reason but to look cool. Kalliope's skin is pretty pale, and that, I can assure you, does NOT change color.